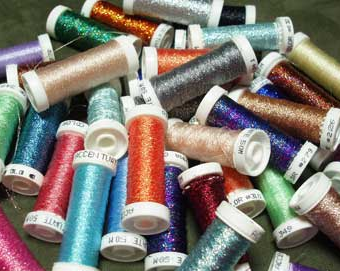 Accentuate is the ideal blending filament, add 1 or 2 ply to silk, wool, cotton to add sparkles. Or use it alone for a transparent look perfect for lighted windows, doors, stars, snowflakes. Ply up for the coverage you desire. When used alone, it has a transparent look to it, making it perfect for lighted windows and doors, for stars, for snowflakes, for anywhere you want a light sparkly cover in your stitching.